There’s a fantastic episode in the first season of The West Wing when all of the staff are disillusioned with the tasks they have been assigned. Josh is exploring the idea of the President nominating two people to the FEC, without taking the names straight from the Congressional leaders. Sam has a meeting with members of the military to ascertain if there can be any progress made in repealing the Don’t Ask Don’t Tell policy that banned openly gay men and women serving their country in uniform. Toby complains to Leo that they have secured only one victory in slightly over a year since the President took office. All of the senior members of the administration, including the President, have become frustrated and the reason is determined to be that they always head for the safe ground – forgetting the grandiose promises of the campaign, favouring instead centrist policies that they believe will increase their chances of getting a second term. 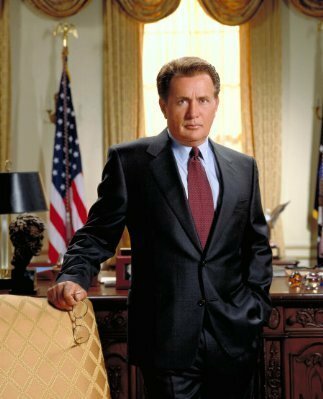 The White House Chief of Staff confronts President Bartlet at the end of the episode to tell him that it is time for them to take risks, pursue the things they believe in and, if they lose, at least they put up a fight. The new initiative was summed up by Leo with the mantra of “Let Bartlet be Bartlet”. I know President Obama is a busy man, so may not have time to watch the whole show, but I wish somebody would at least play him the closing scene – perhaps leave it on loop in the residence – in an attempt to inspire him to focus more on doing what he believes, not solely on retaining office in November. I read “The Audacity of Hope” back in the summer of 2007, when then-Senator Obama was running third in the polls to get the Democratic Presidential Nomination behind John Edwards and Hillary Clinton. For the first time, I believed in a politician and was actually motivated to get behind his candidacy, developing a rooting interest in an election beyond hoping one particular person loses. It was not just me either; all through this campaign, Obama was able to garner grass-roots support because he came across as genuine, passionate about issues and concerned about how to fix problems and would not shy away from a fight. All of the action on tonight’s episode of Mad Men was centred around Sterling Cooper Draper Pryce’s pitch to Jaguar cars for their business, but the real developments were concerned with the progression of the female characters. Set in the 1960s, one of the primary focuses of the show has been gender inequality and the treatment of women as second-class citizens in all aspects of life. 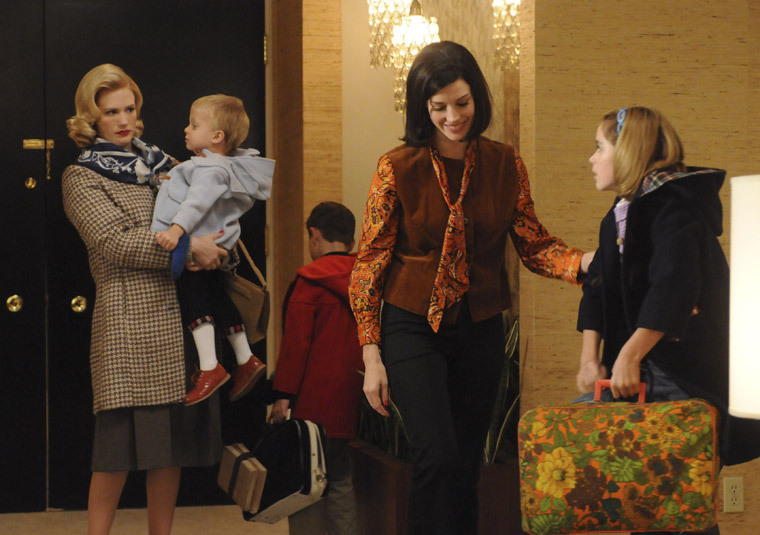 The struggle to gain acceptance in a man’s world on the series has been portrayed primarily through the career development of Peggy Olson, though Joan Harris and Megan Draper are also strong women, who have shown this season they are willing to defend themselves and their rights. Freelancers have been brought in to SCDP to work on the Jaguar presentation, as Don will not put Peggy in the line of fire with chauvinistic men from the car company, leaving her to cover everything else. Miss Olson finds herself literally on the outside looking in on the biggest development at the firm and has to witness a Roger Sterling-bought lunch of lobsters being delivered to the conference room to the cheers of all the guys – even Ginsberg, although I thought shellfish was not kosher. When Chevalier Blanc calls into the office to pull their advertising slots, Peggy proves her worth by coming up with a new spot set in Paris that convinces the client to spend more money, rather than less. However, when this news is taken to Don, he speaks of Ginsberg being free to make the trip once Jaguar is complete – much to the chagrin of his protegé, who rightly believes she deserves the plaudits – and benefits – from the increase in business. Draper’s response is to toss some cash at Peggy so that she can go to Paris – treating her no differently to how the other partners act towards Joan in the other major storyline of the episode – which only adds to her fury. A conversation with Fred Rumsen – former Sterling Cooper employee and the first person there to see her potential – convinces Peggy to search other offers. One comes from Ted Chaough – Don’s want-to-be nemesis from last season – who is willing to pay her more than she originally asks for, thus making Miss Olson feel valued and giving her the recognition she has craved. When she informs Draper of her decision to move on for the good of her career, he acts no differently than before and only tries to throw money at her – though this time not literally at least – in the form of counter-offer. It is not good enough for Peggy and, by the end of the hour, she has picked up a few possessions and is on her way out of the agency with a smile – soundtracked by The Kinks “You Really Got Me” and the destiny of being SCDP’s competition. In the season 3 finale, Don told his mentee that, if she decided not to join them in their new agency, he would spend the rest of his life trying to hire her. It remains to be seen if he will be able to forego his anger at Peggy’s perceived treachery to now follow through on that promise. As Peggy – the first female copywriter at Sterling Cooper – departs, so Joan Harris became the first woman to make partner at SCDP, though her route to the position was not the one she would have chosen. At a meeting with one of the heads of the Dealer Association, Herb Rennett, Ken Cosgrove and Pete Campbell discover that his price for support of their pitch with Jaguar is a night with their office manager. Although Ken is ready to dismiss the notion as completely unacceptable, Pete – of course – wants to win the business more than he cares about any ethical issues and takes the suggestion to Joan. Seeing through his salesman’s patter, Mrs. Harris ejects him from her office, but this does not deter Campbell from approaching the other partners with the idea. Don is completely against such a move and walks out of the meeting, declaring they can win without Herb’s support; Roger is in favour, if it does not personally cost him; Bert Cooper only talks of the importance of the agency having a car company as a client; while Lane Pryce is trying to secure his Christmas bonus, as last week he prematurely wrote himself the check and paid off his tax bill with it. When Campbell suggests that he extend their credit line so that they can make an offer to Joan – a move the Englishman already made with the bank to fund his subterfuge – Lane has to think on his feet and approaches Joan himself. Being more subtle than Campbell, Pryce acts as if he is concerned with what is best for her and, if she were to go through with it, states that her best course would be to demand a partnership and 5% stake of SCDP, not just a one-off payment. 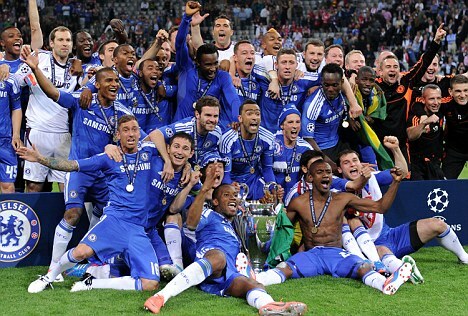 Last Saturday, Chelsea became the first club from London to win the European Cup, as they survived a barrage of pressure from Bayern München to beat the German side on penalties in their own stadium. Bayern were dominant for the first 83 minutes of the game – seemingly encamped in the English team’s half – but they were unable to take their opportunities, with Mario Gomez the main perpetrator of missed chances. On the flanks, Franck Ribery and Arjen Robben were able to penetrate the Chelsea defence on their respective wings, but their final ball was often lacking, or if it was delivered to Gomez, he was unable to convert. Bayern did finally take the lead in the 83rd minute when Thomas Muller directed his header into the ground and into the roof on the net, but after that the German midfielder was forced off the field with a calf strain. That completely changed the momentum of the game as the hosts sat back to defend their lead, allowing the London side to move onto the front foot and forego their defensive duties. From their very first corner of the match, Didier Drogba brought Chelsea level with a powerful header inside the near post – leaving Bayern clearly deflated, after they thought they had already won the tournament. There were shades of 1999, when Manchester United scored two stoppage time goals to overturn a 1-0 deficit against the Bavarian team, but this time München were able to hold on to take the game into an additional thirty-minute period. In this week’s episode of Mad Men, the theme of truth is prevalent, as some characters are open about their predicaments, while others choose to hide reality from all those around them. One person firmly in the latter camp is junior partner, Lane Pryce, who is informed by his accountant back in England that his tax bill of £2900 (at the time, $8000) must be paid within two days, or he risks going to jail. There were hints of Lane’s financial issues earlier in the season, when his wife questioned him on the non-payment of their son’s school fees, and it is clear that they have not been resolved, nor discussed with his family or work colleagues. To continue his subterfuge, Pryce goes to the agency’s bank manager with promises of strong income projections for the new year to have him extend Sterling Cooper Draper Pryce’s line of credit by $50,000 – an amount he then declares as an unexpected surplus to the other partners and suggests Christmas bonuses are in order. When the others agree to this, but want to delay the timing until after the party, Lane writes his own check prematurely, forging Don’s signature by tracing an old receipt from Joan’s office. While his dealings have not been detected by anyone else at the agency by the end of the episode, there is an inevitability of him being found out when SCDP discovers Mohawk has suspended all advertising activity while their machinists are on strike – resulting in Sterling, Cooper, Draper and Campbell deciding the partners should forego their own bonuses to offset the income drop. If Joan Harris had not yet returned from maternity leave, there would have been an opportunity for Lane to cover his tracks, but her efficiency and competency at her job means that the Englishman is on a collision course with the truth in the coming weeks. Harry Crane also decides that the truth is not the best path to take in his storyline this week. He is being hounded by former Sterling Cooper employee, Paul Kinsey, one of those left behind when the new firm was formed at the end of season three. 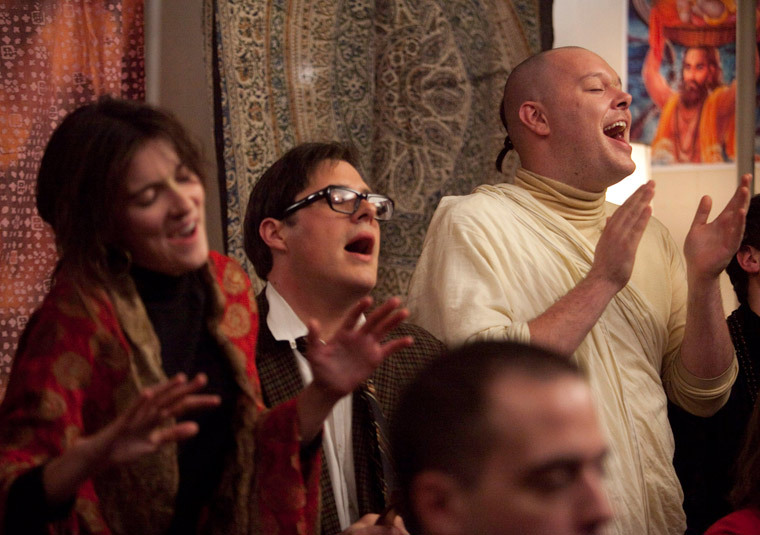 In the early years of Mad Men, Kinsey always wanted to be seen to be cool and with the times – at one point he was dating an African-American woman, seemingly because he believed being in such a relationship brought him cache, rather than because he had any real interest in her – and he has now embraced the Hare Krishna movement, including the shaved head and ponytail. Paul does now at least admit that his enthusiasm for the group is disingenuous – he is only continuing to go along with it to pursue a relationship with a woman known as Queen Lakshmi. The one-time Communist tells Harry he wants to leave for a new life with her and needs a favour from his former colleague – as Crane is involved in television, Paul believes he will be able to pass on a Star Trek script he has written to the bosses at NBC. Harry is apprehensive about doing this, not least because he is unsure if the show will still be on the air the following season, and when he reads it, he is unsure how to proceed since the finds Paul’s work to be unimpressive. With the start of Euro 2012 a little more than 2 weeks away, it’s time to launch Political Footballs Prediction Competition for the tournament. This is free to enter and the winner* gets a $50 gift certificate to SoccerPro.com – an online retailer where you can now buy Euro 2012 soccer jerseys. To enter, simply predict which countries will make the quarter-finals, semis and the final, as well as the overall winner of the tournament. To assist you in your picks – here is the tournament grouping and knock-out stage bracket. *If the winner is outside of the US, they will have to pay any customs fees for the items selected with the gift certificate, but shipping will be included. **If you select a team to top their group but they come second, you still earn any later round points they earn if you have predicted they will be playing different opponents – your maximum potential score will just be reduced. If multiple entries are still tied after tie-breakers, the winner will be selected at random. Get your entries in and good luck – I will be posting a preview of the tournament a few days before the first game and will be including my own predictions in that. 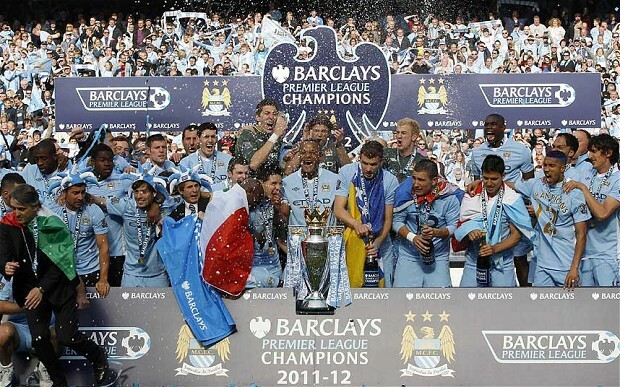 This week in: English Football – City Champions of England, Chelsea of Europe Next? On a crazy final day of the Premiership season , Manchester City secured their first league championship since 1968, thanks to two goals in stoppage time in their game against Queens Park Rangers. It was perhaps the only way a club like City – whose own fans expect them to mess up at some point – could have secured the title. At the 90 minute mark, their rivals United looked set to win their 20th English league title, but strikes from Edin Dzeko and Sergio Aguero in injury time brought the trophy to the Etihad Stadium – leaving Sir Alex Ferguson, his players and their fans in a state of shock up at the Stadium of Light. Many have since compared the turnaround to United’s own stoppage time recovery in the Champions League final back in 1999, but in that instance both they and Bayern München were playing for the same prize. This time around, City were facing a QPR side who were playing for their own survival in the Premier League. While the home side were doing the large majority of the attacking, Rangers managed to absorb that pressure and even took the lead with 10 men, a situation they were put in by their captain, Joey Barton, who elbowed Carlos Tevez to earn a red card, then kicked Aguero and attempted to headbutt Kompany on his way off the pitch. Thirteen years ago in Barcelona, Bayern were the dominant team and United were lucky to be just a single goal behind by the end of the 90 minutes – in contrast, City on Sunday had 35 shots to QPR’s 3, as well as 62% of the possession. Despite the defeat, Queens Park Rangers avoided relegation as Bolton were held to a 2-2 draw by Stoke at the Britannia Stadium. A controversial late penalty – awarded by Chris Foy, who was also the referee for Tottenham’s defeat in the same ground earlier this season, with many decisions going the home team’s way – condemned Wanderers to Championship football starting in August, after more than a decade in the top flight. Back at the Etihad Stadium, the mega-rich club may only have got into the position they are in thanks to a large expenditure in the transfer market that has propelled them above their piers…but enough about QPR. City of course have spent a fortune to secure their first title in the Premiership era, but there was a game from their dark days of lower league football that this match did mirror. A dozen years ago, Gillingham had a 2-0 lead over them going into injury time in the playoff final to gain promotion out of the third tier of the English Leagues. Just like on Sunday, the Blue half of Manchester were able to strike twice in the additional minutes before the final whistle, and went on to claim their spot in the old Division 2 (at the time confusingly called Division 1) via a penalty shootout. If the two sides now meet in a cup tie, Gillingham fans are sure to remind their City counterparts that many had left early that day with a chant of “Two Nil and you all went home”. Unbelievably, some supporters headed to the exits before the final whistle last weekend as well. Absolute muppets – but I guess they will always remember that day they managed to beat the traffic. Arsenal were handed three goals by errors from – former Tottenham Keeper – Martin Fulop in their match against West Brom on Sunday – enough to give them a 3-2 win and secure for them third place and Champions League football again next term. While Spurs also won to end the season in fourth place, they must now wait for Saturday’s final between Chelsea and Bayern München to determine which European competition they will be competing in next season – if Chelsea win, Tottenham will be relegated to the Europa League. My Facebook timeline has been filled with Arsenal fans stating their support for the London club in this weekend’s game, which is something of a surprise. Admittedly, should Roberto DiMatteo lead his team to a win over Bayern, the Gunners will get to see their biggest rivals miss out on a place in the Champions League, but they would also see the club who are their second biggest local enemy actually win the competition, not to mention have their own side forced to play a qualifying round in August. Had Spurs somehow managed to end up third, I still would have been rooting for Bayern this weekend, now they will be getting huge amount of support from the Tottenham faithful. Although the above quote was a great put down by Don towards the end of this week’s episode of Mad Men, it clearly is not true. The show’s world has now reached 1966 and the older generation is rapidly realising that they are being replaced by a new one with fresh faces and ideas. Draper is concerned that his role as creative genius will be taken by Ginsberg; Betty sees her younger self in Megan; while Roger and Bert are struggling to maintain any relevance at their own agency, watching Pete Campbell run the majority of the client relationships. After Pete has announced to the Sterling Cooper Draper trio of SCDP that he believes he can get them coverage in a New York Times article about hip advertising agency, Draper goes through the process of getting together a portfolio of their best work. The only problem he finds is that all of their showpiece articles were written by Michael Ginsberg – not Peggy, his prodigy, nor himself. Joan attempts to comfort Don by telling him it shows what a great job he has been doing as creative director, but also saying he should include “The Letter”. An absence of impressive work from the previous year gets Draper’s creative and competitive juices flowing – he wants to prove that he is still able to provide valuable input for their pitches to clients. A Sunday session in the office does not provide inspiration for Don, but an unplanned peruse through Michael Ginsberg’s work – stumbled upon because of left on light in his office – is enough to make Draper stay late to come up with something he believes will impress both the clients and his subordinates. At the creative meeting, the anti-hero of the show is patronized by Ginsberg who tells Don that he impressed that his idea was good, given that he had not written for so long. This notion that he is a has-been is exacerbated when Draper’s creation is relegated to a backup by account managers Pete and Ken, but Don deliberately leaves Ginsberg’s work in the cab prior to the client meeting, taking only his own for them to see. Draper knows exactly what he has done to the younger employee and his justification of making the sale does not satisfy Ginsberg, nor does it abate the competitive juices that are now flowing through Draper. The relegation battle – we will see crying fans of either Bolton or QPR today, Blackburn and Wolves supporters have already accepted their fate. Champions League race – Arsenal, Spurs and Newcastle will finish 3rd, 4th and 5th in some order – third guarantees Champions League football next season (at least a place in the qualifying round); the team that finishes fourth will have to wait and see how Chelsea get on in the final in Munich next week to determine which competition they will be in; and the fifth placed team will head off for their summer break knowing they will be in the Europa League in August. Will it be QPR or Bolton fans with their heads in their hands today? Manchester City vs QPR (ESPN2, TWC 729) – City win – they are champions; QPR avoid defeat, they stay up. Sunderland vs Manchester United (FX, TWC 710) – United need to better City’s result to end up Champions, or outscore them by 8 goals to overhaul them on goal difference. Stoke vs Bolton (FSC+, TWC 470) – Bolton need to win and hope QPR lose to City to avoid relegation. Everton vs Newcastle (Only available via online subscription on Fox Soccer website) If Arsenal win, they finish third – a draw guarantees them fourth ahead of Newcastle. Tottenham need to win – which ensures they finish no lower than fourth – and hope West Brom get at least a point off Arsenal, to prevent finishing below their rivals for the 456th consecutive time. Newcastle will finish third if they win, Spurs don’t, and Arsenal lose. My setup for the morning: TV set to watch Spurs vs Fulham (has to be), phone streaming Man City vs Bolton on ESPN3, West Brom vs Arsenal on picture-in-picture. Beer of choice for the festivities: it’s 9:30am – I’m sticking with coffee and toast. Two things. Firstly, Spurs have to play Gareth Bale at left-back today, rather than on the wing, as Benoit Assou-Ekotto is injured and his replacement, Danny Rose, is suspending after his dismissal against Aston Villa last week. Secondly, Pizza Hut’s new product that has a crust made of cheese bites should not be allowed to be called a pizza, that’s sacrilege. Or at least there ought to be a band on them advertising it in Brooklyn, when I am sitting walking distance away from Grimaldi’s and a subway ride away from Spumoni Gardens (have the Sicilian slice). All of the final 10 games of the Premiership season kick off simultaneously. TOTTENHAM TAKE THE LEAD! Adebayor opens the scoring at White Hart Lane, put through with a beautiful pass from Rafael Van der Vaart. We’re all going on a European tour! It was status quo in the title race last weekend, as Manchester City won 2-0 at Newcastle, while United recorded the same scoreline in their home victory over Swansea. Mancini’s side had to work hard for their win, with their opponents still in the hunt for a top four finish, and it was not until the 70th minute that they finally made the breakthrough with a goal from YaYa Toure. Sir Alex Ferguson sent his team out knowing that they would need to record a big victory over Swansea to have any chance of overhauling the goal difference between themselves and their rivals – which currently sits at 8 – but the team from South Wales were able to restrict United to just the 2-0 win. 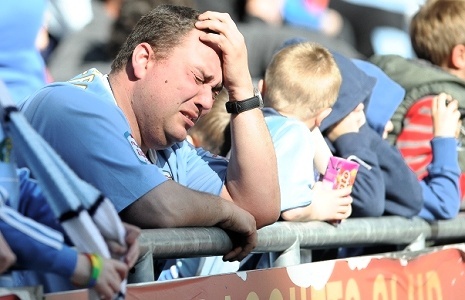 Should City beat Queens Park Rangers at the Etihad this weekend, then they will achieve their first league title since 1968 and get one over on their neighbours. Blackburn’s relegation to the Championship was confirmed on Monday with a 1-0 defeat against Wigan at Ewood Park. The home fans continued their (season long) chants for manager Steve Kean to be sacked, but added two more protests to their repertoire for this game. 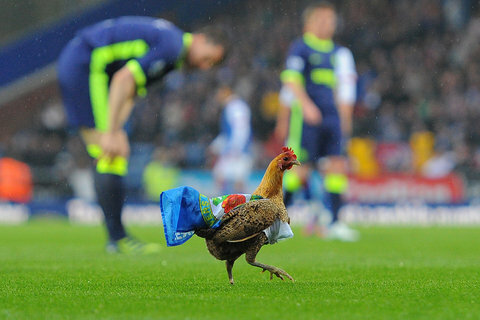 A chicken was released onto the pitch bearing the message “Venkys Out” – Venkys being the poultry company that currently owns Blackburn – and the bird had to be caught by Yakubu and Ali Al Habsi; then a Rovers’ fan ran out of the stands and threw his season ticket to the ground. That latter act of defiance was common place at White Hart Lane during the years I was regularly going to games – but fans who chose to show their displeasure in that manner always waited until the final home game of the season – meaning that all they were doing was throwing their season tickets onto the pitch instead of into the bin as they left the stadium. The league season is often said to be a marathon and not a sprint – if that is the case then, while the Manchester clubs have been the elite athletes setting the pace, the sides who are battling for third and fourth place – Arsenal, Spurs, Newcastle and Chelsea – have been the amateurs in the middle of the pack who stumble through the final few miles, begging for the finish line. Arsenal’s 3-3 draw with Norwich means they have won just one of their last seven league games – although that victory was, bizarrely, over the presumptive champions, Manchester City. Tottenham are like the person who decides to run the 26.2 miles whilst juggling – they always seem to make it unnecessarily hard for themselves. At the weekend, they dominated the first half against a woeful Aston Villa side, yet shortly after the interval they found themselves both a goal and a man down. A penalty earned Spurs a point, but they will now need to win their game against Fulham on Sunday, then hope for either Arsenal to slip up against West Brom, or Chelsea to lose in their final against Bayern München, if they are to return to the Champions League next season. Newcastle’s loss against Manchester City means they too will need help from elsewhere to sneak into Europe’s top club competition in August, but they still have an outside shot at finishing third. Chelsea won the FA Cup for the fourth time in six years by beating Liverpool 2-1 at Wembley on Saturday, but then fell to a 4-1 defeat against the same opposition in the league on Tuesday night. That loss means, regardless of their result against Blackburn on Sunday, Chelsea will finish the season in 6th place and will be in the Europa League next season, unless they win in Munich on May 19th. With the title, European places and relegation battles still to be decided this weekend, here is a rundown of the fixtures with a breakdown of what is at stake for each club. Chelsea – Highest possible finish: 6th; Lowest possible finish: 6th. In the Sylvia Plath poem from which tonight’s episode of Mad Men gets its title, the protagonist faces oppression from the Nazis and imagines herself reborn – like a phoenix rising from the ashes. In the show, it is Megan who is attempting to engineer her own renaissance: from advertising copywriter, stuck in the shadow of her husband, to aspiring actress, taking classes and auditioning for Off-Broadway plays. After last week’s conversation with her Dad – in which he criticised her for not following her dreams and jumping into a successful life, without putting in the hard work to earn it – Megan has been convinced that her future no longer lies with Sterling Cooper Draper Pryce, she is just too scared to tell Don. As a result, she is returning secret phone calls for a callback from the pay-phone rather than in her office, then lying to both her husband and her boss, Peggy, about her whereabouts that evening. From their trip to Plattsburgh to visit Howard Johnson, we know that Don loses control when he does not know where Megan is, thus he spends the night drinking and calling up Peggy to find out what she knows. When his wife does return home, Draper gives her the opportunity to continue lying to him by revealing that he had spoken to Peggy and therefore knew she was not working late. For someone who spent his first marriage hiding his identity and affairs from Betty, Don is not artful in recognising when someone is deceiving him. The following day, Peggy berates Megan for putting her in a position where she would have to lie to Don, causing her anxiety and a sleepless night. Because her boss assumes she is having an affair, Megan tells her that in fact she was on a callback for a play and she wants to get out of advertising to return to acting. Peggy is completely understanding about the situation and consoles…wait, that’s not right. Peggy flips out at the thought that anyone could entertain the idea of leaving the amazing job of copywriter at an advertising agency, assuring Megan that people would kill to have her position. This hostility carries over to a creative meeting about a potential new client – Cool Whip – at which Mrs. Draper uses her acting chops to pretend that everything is fine with her, even partaking in some banter about the product with her husband that will be the showpiece of their pitch at a test kitchen. The pretense infuriates Peggy – who ends up snapping their tagline of “Just Taste it” to end the skit – but it also eats at Megan, resulting in her waking up Don in the middle of the night to confess her lie and revealing her desire to quit SCDP. Like Peggy, Don cannot believe that his wife would consider not working in advertising, given that she has a natural talent for it. However, Megan is relieved that he is understanding and wants her to pursue her dreams, making arrangements for her to finish at the agency the next day.